Make sure your packages get where they're supposed to go without any confusing markings showing through when you use these shipping labels. TrueBlock® Technology completely covers everything underneath. 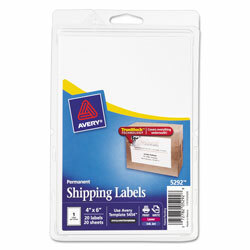 The adhesive sticks to more tough surfaces, ensuring your label doesn't fall off your package. It's easy to create custom labels with logos, barcodes and more. Just print your labels right from your own printer. It's easier than ever to get the job done right. Label Size - text: 4 x 6; Label Color(s): White; Machine Compatibility: Inkjet Printers; Laser Printers; Catalog Description: Shipping. White Mailing and Address Labels from Avery! 1230 In Stock today.